I’d like to talk today about ‘creative precognition’ from personal experience, focusing here on art and writing as the two prime ‘creative modes’ I’ve engaged in, by way of example. Of course, we’re all creative beings – creating our reality – in every moment, in every breath we take, and there can be precognitive (future sight/pre-recognition) symbolism in everything we do, from the ingredients we are drawn to prepare a meal with, to which plants we feel attracted to grow in our garden or place in a vase, to a song or piece of music we want to play over and over again. Energy flows, connects, ripples and weaves constantly. For me, the weaving became literal in this life. 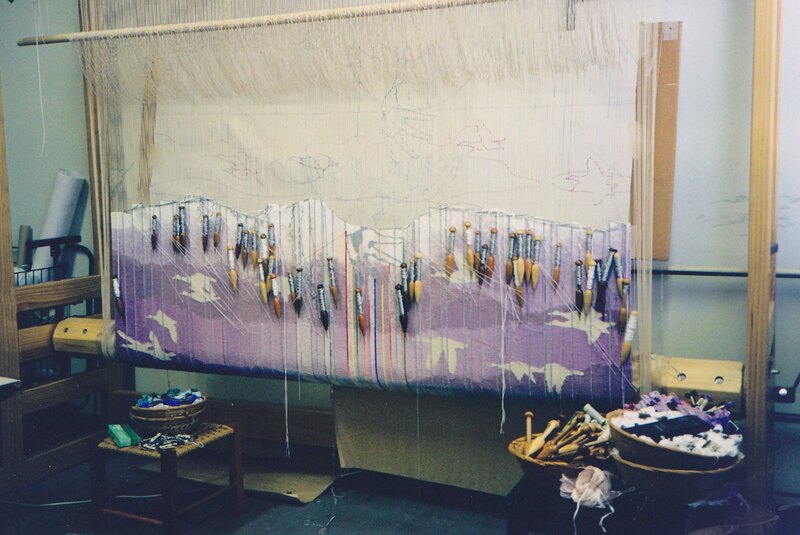 I worked as a professional tapestry weaver for more than twenty years, from starting a traineeship at nineteen with the only commercial tapestry studio in Australia (these days called Australian Tapestries) to weaving my own designs by commission until my creative stream shifted to writing. After a decade moving between Melbourne (Australia) and London (UK), I returned to Perth, Western Australia, and wove the tapestry below as part of a postgraduate course in Fine Arts. 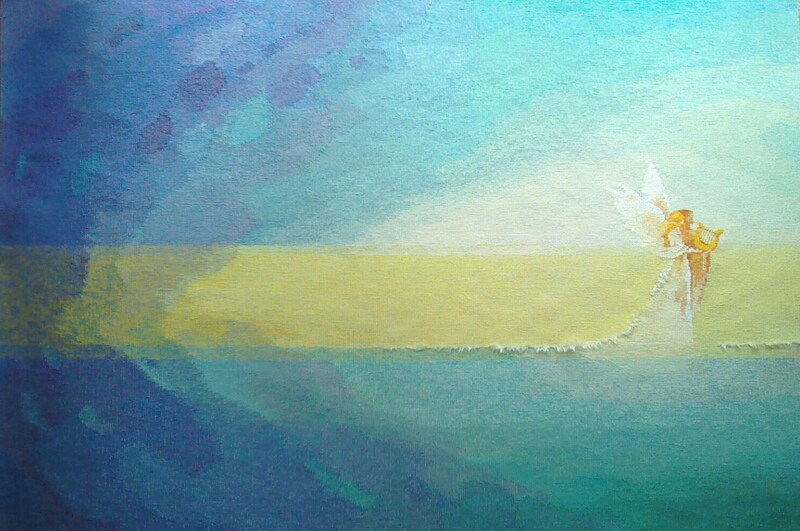 I was writing a thesis about the (re)appearance of archangels in the arts in the 1980-90s, and while sitting on a beach near my home at the time, had a vision of Archangel Gabriel standing on the waves, with a rainbow of light pouring from his hand, which was held forward, down into the wave below. Gabriel, woven 1996-7, 2.4 metres x 1.8 metres. 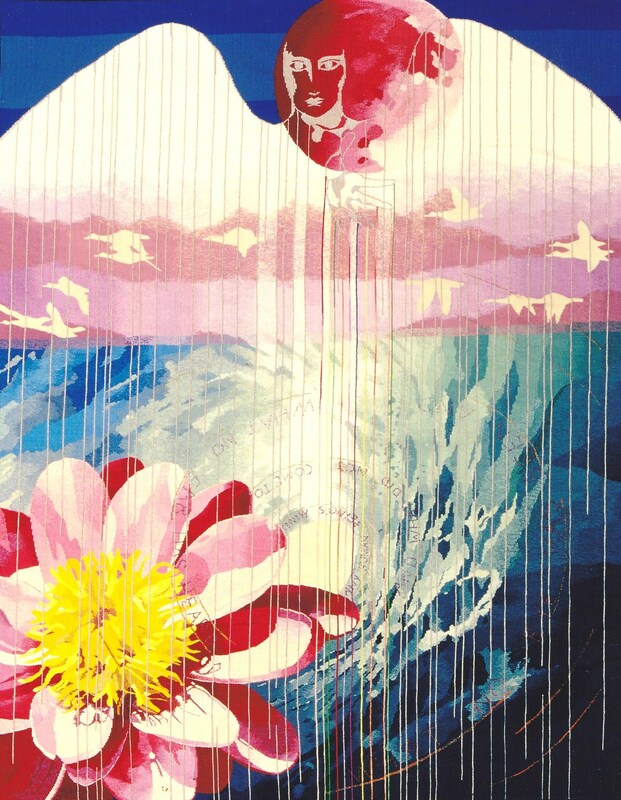 This coincided with a dream of the ocean, in which its entire surface was covered in pink water lilies – so in the tapestry, Gabriel’s Lily became a pink water lily on the sea, water being the element associated with Gabriel (the Mother aspect of Source, waters of conception and birth). Perhaps because I was carrying a child at the time, the Moon also turned a ‘rose’ shade in this tapestry. The Rose, as I now know, is connected with the creational spiral energy, which also reflected in this tapestry in the form of the curled Wave. Looking at this piece now, I see so much I didn’t understand consciously then, about the incoming Wave of ‘ascension energies’ (INception) around this planet, and how we intuit and connect with it. For the text running into/from the vortex of the wave in the tapestry is Gabriel’s text from the Sufi mystics, and reads ‘What no eye has seen, what no ear has heard, and what did not come to any human being’s mind.’ Pure truth, as the Wave of Source is felt directly through our core, the seat of our soul, the inner heart chamber…..which ignites the Rainbow Bridge between heart and higher chakras, and merges their energy and flow. The white geese flying in the middle band of the tapestry were a symbol of Gabriel in the Middle Ages, when he was called the himmeljaeger, the ‘Heavenly Hunter’, and people called the flying geese ‘Gabriel’s hounds’. Now I see birds of white light in the skies, have heard the ‘angels’ trumpets’ in the long rumbles of ‘Earth sounds’, communicate with and photograph Carian (birdlike) ETs of white and golden light, among others (which I would never have dreamed of 18 years ago!). Ai’Shii’Te’Ra: White Carian Being, eagle-like face above blue owl. See this post for details. Photo taken May 26, 2015. 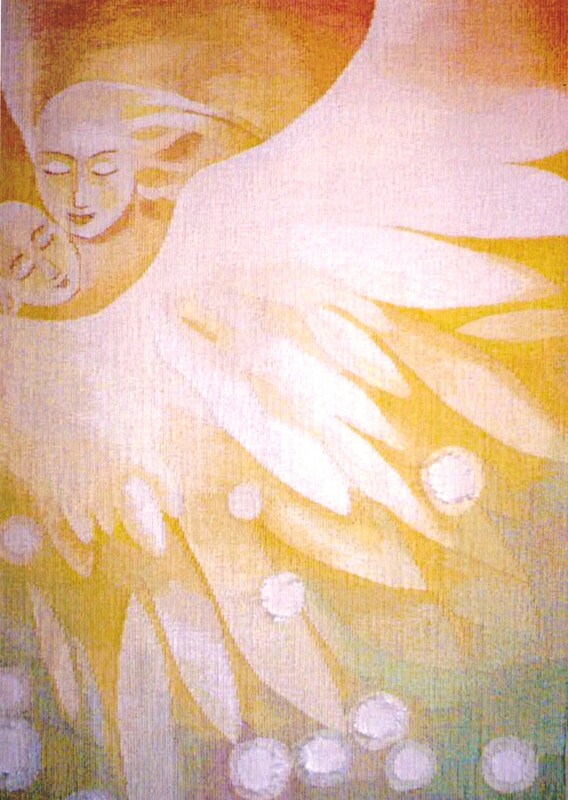 Feeling into the Gabriel tapestry now, the merged energy of my Twin Flame is also in there, which I’ll get to shortly. Next is another angelic tapestry, Mother and Child, woven ten years ago. Mother and Child, woven 2004. At that time I’d never heard the term ‘orbs’, although had at times seen balls of fuzzy light which I thought of as discarnate souls. 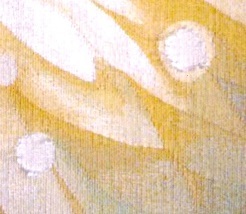 This was the first tapestry I felt to weave in these balls of light, with ‘furry’ or fuzzy rims around them. 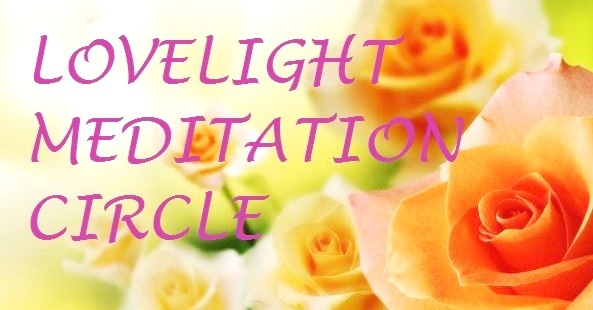 Now, I can see/feel how higher dimensional beings were trying to reach me, but my heart centre still had some blockage energies, so although aware of their presence, I didn’t fully feel the love, the soul connectedness, all around me. Yet, it came through dreams, visions and artworks, as a continuous messaging of light, life and love beyond the 3D reality, part of the ‘golden thread’ I felt running throughout my life, no matter how challenging living in this world got at times. The stream was breathing through me non-stop, as it is through every one of us, forever. The joy is remembering it, and swimming consciously again! Feeling now into my recently-remembered Twin Flame connection, deeper into memories and our many incarnations, the special significance of the constellation Lyra – as the first place we came to together in this universe – opened up a new level of understanding of a profound attraction I’d had all my life to Orpheus, the god of Music, whose lyre (harp) became the constellation of Lyra in ancient Greek mythology (the harp being originally made by Hermes and given to Apollo, then gifted by the ‘Sun God’ to Orpheus). This Lyran origin point has unfolded into memories now, but even before having any conscious knowledge of it, I had written stories, poems and many drawings of Orpheus since teenage years, and wove two tapestries of Orpheus and his Muse. Here is the second one, with Orpheus and Eurydice, his lost love, reunited, as they walk out from the shadows of Hades’ Underworld into the light, along a ray of gold. Muse II, woven 2008, 1.3m x 1m, figures based on Orpheus & his Muse, painting by Edmond Jean, 1895. In the original myth, Orpheus – whose lover Eurydice had been bitten by a snake and died – went down to the land of the dead, guided and guarded by Hermes, and played his harp to Hades, who agreed to let Eurydice return to the land of the living, on the condition Orpheus not look back, on the path to the surface, which he wasn’t able to fulfill. Insofar as Ashura and my Twin Flame path is like that of Orpheus and Eurydice, we now walk as One in my/our Inner Heart together again, completing the circle, and moving again into higher spirals of Life to full multi-dimensional reunion. Tapestry weaving I always felt as harp-like. You start with a bare loom, string it with the warp threads, then weave in the weft, in colours, like a visual harp of colours. As one who occasionally experiences synaesthesia (hearing colours, seeing sounds), I know tones and colours are identical and interchangeable, just different modes of the same frequencies. In Chinese astrology, Vega, the alpha star of Lyra, was called ‘the Weaving Maiden’, who wove tapestries of spiritual light, had a ‘fall from grace’ and was separated forever from her lover, the Ox Boy, by the Milky Way….until a bridge was made by magpies for them to meet again. There’s a relationship in this story to the drop of Lyra from high frequencies, the leaving of its people (leonines and humans), and to carian/avian beings and the constellation of the Ox/Bull/Taurus (which I’ve written about in previous posts such as this one…and to my Twin Flame, Ashura, and his connection to bull symbolism. The Weaving Maiden and the Ox Boy, reflect for us a personal memory. About seven years ago, I shifted from weaving to writing , and wrote a series of fantasy novels that drew on recurring dreams, from about the age of eight, of another world, much larger than Earth; a hollow world with a star at its core and lands on the inside, peopled by immortal semi-angelic beings made of golden crystalline light. I called the world Siaris, which was how I heard the word ‘Sirius’ as a young child. I also ‘saw’ that world go through a (quite complex) ‘ascension process’, which I mirrored into the novels. They’re not ‘in print’ at present, as the publishing house I was contracted to closed in 2015, but below is the cover of the third novel. When this cover art came back from the publisher’s cover designer it triggered a strong sense of recognition. Cover art by Kelly Shorten, 2013. It wasn’t until connecting more closely with Ashura (currently captaining the Shem Arua), that the likeness became clear…not exactly in facial features, but in energy. 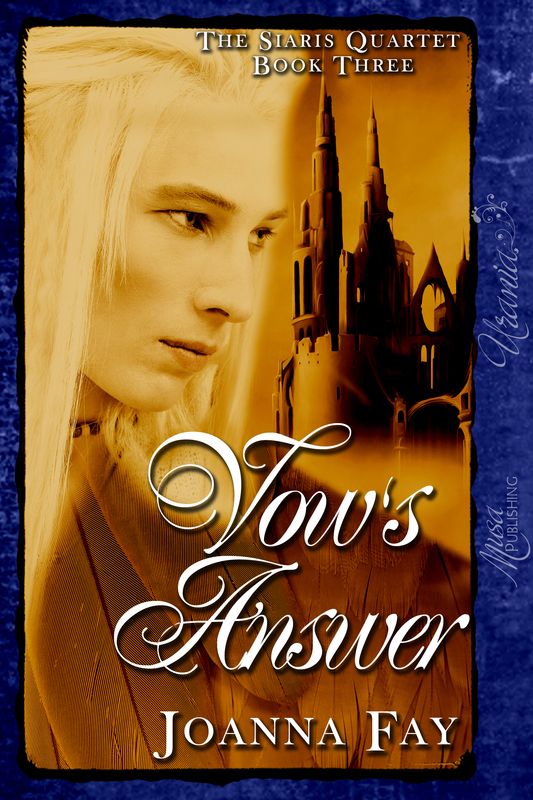 In the novels, the character on that cover was the male of a Twin Flame angelic couple. Wheels within wheels….as the threads of the tapestry converge and weave together. 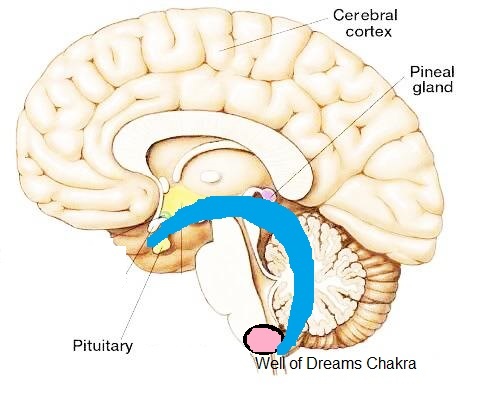 This visualization comes from Ashura now, for strengthening and keeping crystal clear your Bow, the ‘bow of the three chakras’ in your head that form a crescent, from pituitary chakra, to pineal chakra, to well of dreams chakra (at the brainstem, sends messages to the lower chakras). 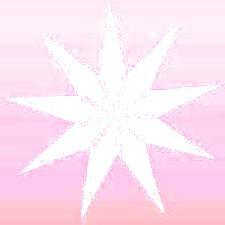 Centre into your Heart Star, and expand it throughout your auric field. Breathe golden light into your heart centre, and radiate it through and around your auric field as a Golden Apple of Light. Now bring your focus into your Pituitary Chakra and visualize the chakra within a five-pointed Star of pure white Light. Secondly, shift your focus into your Pineal Chakra and visualize the chakra within a seven-pointed Star of pure white Light. Thirdly, curve the Bow, and bring your focus down to your Well of Dreams Chakra, and visualize the chakra within a nine-pointed Star of pure white Light. 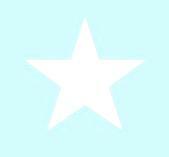 Hold the three White Stars and feel the whole Bow as white light, stable, secure, free of all controlling/regulating influences, connected with your Heart Star and Crown. You may also wish to open your three main Star Chakras, the Earth Star (under your feet), Heart Star (centre of chest) and Soul Star (above your head) and also see them as three big stars of white Light. We Love how you Shine! If you haven’t done so before, I hope what has been shared here inspires you to feel into your own ‘creativity’, in whatever forms it takes for you, and how the flow of Love and Light of Source is communicating to, within and through you, always.